Release Date: February 10th, 2006 (Cinema Village) by Emerging Pictures. BASIC PREMISE: A documentary about Ivan Thompson, a man who makes a living helping American men to find a wife in Mexico. ENTERTAINMENT VALUE: By all means, Ivan Thompson, a.ka. Cowboy Cupid, doesn’t run a typical business. He charges American men $3,000 to match them up with a potential Mexican wife. According to his observations, Mexican women are less demanding than American women. Even some of the Mexican women admit that all they want is to be loved. 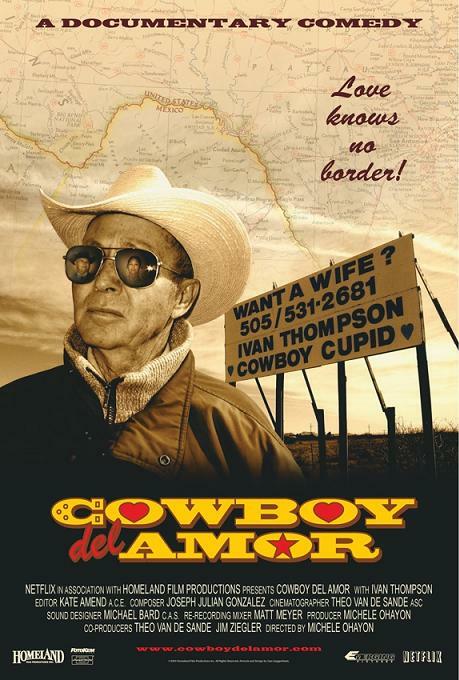 Just in case you don’t believe that this is true, Cowboy del Amor follows a few of Ivan’s clients as they search for their perfect match among many candidates who answered the newspaper ad. One of them found his ideal wife almost immediately, while others took their time. Ivan comes across as dryly funny, off-beat, and youthful at heart—even though he’s well past his prime. For example, as the camera lingers on him in a motel at the end of the day, he kindly asks to the filming unless you want to see him get naked—which wouldn’t be a pretty sight. Then, when he’s given his $3 water bill for his new home in Mexico, he jokingly replies that it’s too expensive for him and would only settle for $1.50. In another scene, a Mexican woman becomes more emotionally attached to him rather than his client. It would have been interesting to know more about the romantic history of the clients, but director Michèle Ohayon uses a more straight-forward documentary approach rather than just interviewing everyone, which would have been boring. Therefore, it’s easy and very engaging to follow along the clients’ adventures as if you were actually there with them. SPIRITUAL VALUE: There’s more to Ivan than meets the eye. Occasionally, he seems to be a stubborn misogynist, like when he responds to letters from women who claim that his business is just as sick and degrading as the prostitution industry. To some degree, he does stereotype American and Mexican women. However, deep down inside, you can tell that he had been emotionally wounded by women in his past. It’s somewhat heartwarming that he cares about other lonely, emotionally wounded men who just want to find love at its simplest for. Ultimately, all he does is match demand with supply and, in turn, make two people happier than they were before. If only he could apply the same magic to himself to find his own ideal wife. At least he remains content about his life, even though it’s full of mistakes and regrets. Just like the saying goes, what doesn’t kill you, only makes you stronger. It's never too late to give up on love or life. IN A NUTSHELL: Watching Cowboy del Amor is like love at first sight! A strange, yet funny and memorable experience that tugs your heart when you least expect it to!